Around 600 million metric tons of water ice were discovered in shadowy craters at the moon's north pole. How much is that, in terms that mean something to you? Possibly enough to sustain a mother-F-ing moon base, that's how much. A piece of NASA radar equipment hitching a ride on an Indian probe made the discovery, which was reported earlier today. It was only last September that water ice was confirmed to exist on the moon's south pole, but these significant deposits bring us that much closer to the ultimate space nerd dream of a base on the moon. 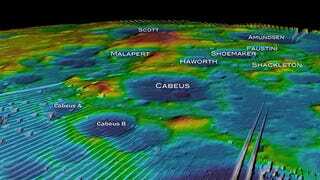 "The new discoveries show the moon is an even more interesting and attractive scientific, exploration and operational destination than people had previously thought," said Paul Spudis, a NASA engineer who works with the Mini-SAR radar equipment. Scientists say the water, which may be more readily available than that found at the south pole, could be mined for fuel and oxygen or distilled into drinking water for lunar dwellers.